Along with the Homemade Cracker Jack, this is my other Oscar party snack this year. 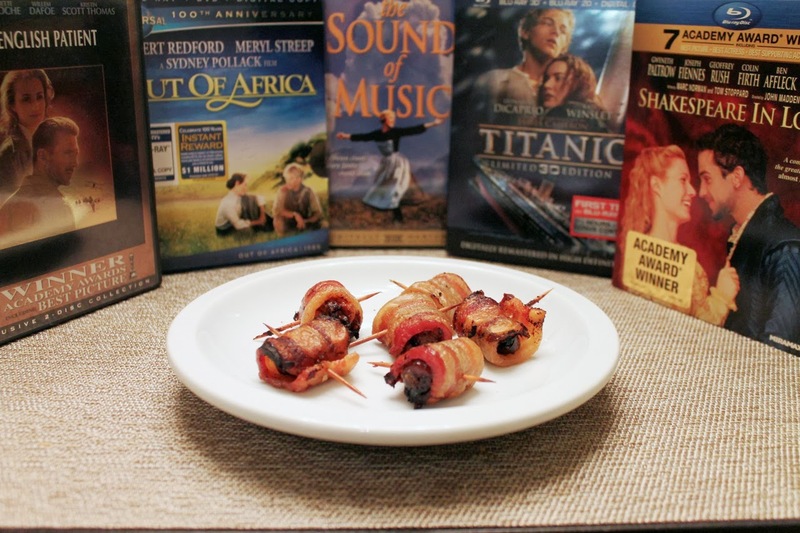 It's a little more sophisticated, the kind of savory finger food that goes well with a sweeping epic drama with a bit of romance. Something like Titanic, The English Patient or Shakespeare in Love. This recipe is really pretty easy. Handling the dates can get sticky, but that's about the most difficult part. The roasting time will vary depending on the bacon used. I buy the thick bacon from the meat counter at Whole Foods, so I needed to roast this longer than if I'd used something thin. Just keep an eye on it and be sure to turn them over occasionally or they could get burnt on the bottom. Pair this appetizer with the 12 Years a Slave, Dallas Buyers Club, Her and The Wolf of Wall Street cocktails. 2. Cut a slit down the length of the side the date. Pull it open and remove the pit. Also remove the hard part where the date was attached to the plant, if not already removed. Place a piece of blue cheese cut to fit in the cavity left by the pit and squeeze the date closed (it probably won't close all the way, which is fine). 3. Wrap each date with a slice of bacon and secure the bacon with a toothpick pierced through where the bacon overlaps and through the date to the other side. Place the wrapped dates in a roasting pan and roast for 10 minutes if using thin bacon and 20 minutes if using thicker bacon, turning them halfway through. When the bacon has crisped, remove from the oven and set on paper towels to cool.